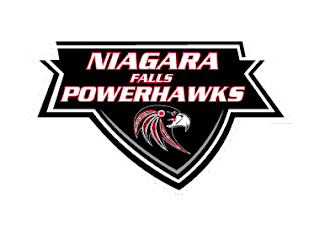 The Niagara Falls PowerHawks advanced to the second round of the NA3HL playoffs after a pair of wins against the Skylands Kings Friday and Saturday evenings at the Hyde Park Ice Pavilion. The PowerHawks will face the Binghamton Junior Senators in the second round. On Friday night, the PowerHawks skated away with a commanding 8-3 victory over the visiting Kings. Craig Garrigan gave Skylands an early, short-lived lead at 10:41 of the first period. Steven Ford and Steven Gay provided the assists. Niagara Falls responded with a pair of goals less than a minute apart. Branden Tripi tied the game at 14:14 on the power play. Andrew Logar and Kurt Villani assisted. Gage Mueller gave the PowerHawks their first lead at 15:02 on another power play goal, with assists credited to Stephen Minichiello and Evan Domiano. The PowerHawks kept the goals coming in the second period. Matthew Minichiello extended the lead to 3-1 only 1:04 into the period. Logar and Stephen Minichiello assisted. Andrew Logar added his own power play goal at 3:07, with assists from Matthew Minichiello and Brandon Schweickert. Matt Stewart gave Niagara Falls a four-goal lead at 7:13. Michael Olszewski and Schweickert added their names to the scoresheet with the assists. Eric Vanderhoff gave Skylands a little spark at 14:56 of the second period to make the score 6-2. Steven Ford provided the lone assist on the play. Kurt Villani scored with only 47 seconds left in the period for the PowerHawks. Matthew Minichiello and Nathan Walerowicz assisted. Walerowicz added a goal of his own at 11:10 of the third period. Matthew Minichiello and Andrew Logar added assists to their totals on the night. Twenty-seven seconds after the Walerowicz goal, Evan Domiano was awarded a penalty shot. His goal got past Mathias Yttereng to give Niagara Falls an 8-2 lead. Craig Garrigan scored his second of the night near 38 seconds after the penalty shot. Craig Scarpa and Steven Gay assisted on that final goal of the contest. Kris Augustine stopped 28 of 31 shots thrown at him in picking up the win for the PowerHawks. Yttereng turned away 34 of 42 shots for the Kings. The PowerHawks were 3 for 4 on the powerplay, continuing their success from the regular season. Evan Domiano opened the scoring Saturday night to give the PowerHawks a 1-0 lead at 7:05 of the first period. Kurt Villani and Gage Mueller assisted on the goal. Steven Ford tied it for Skylands at 10:50 with an assist from Eric Vanderhoff. Andrew Logar broke the knot only 64 seconds later. Stephen Minichiello and Nathan Walerowicz assisted. Brandon Schweickert made it 3-1 at 18:49 on the power play. Stephen Minichiello provided the assist. Logar tallied his second of the night 4:51 into the second period. Kurt Villani and Matthew Minichiello were credited with the assists. Logar completed the hat trick at 8:49, with Matthew Minichiello and Walerowicz assisting. Dylan Dinzik made it 5-2 with a power play goal at 10:10. Craig Garrigan and Lionel Landry assisted on the goal. Skylands tightened the score to 5-3 when Steven Ford scored at 11:52 with help coming from Craig Scarpa. Branden Tripi added to the PowerHawks total with a power play marker at 17:05. Logar and Brandon Schweickert assisted. Evan Domiano’s unassisted goal with only 1:07 left in the second period made it 7-3. Sergei O’Sullivan gave Skylands a little hope in the game at 15:18 of the third period. However, they were unable to put another puck in the net. Matt Stewart put the capper on the game for the PowerHawks with only 18 seconds left on the clock. Kurt Villani provided the lone assist. Kris Augustine stopped 18 of 22 shots thrown at him by the visiting Kings as he won his second game in as many days. Mathias Yttereng made 31 saves on 39 shots for Skylands in the loss. The PowerHawks were successful again with the man advantage, going 2 for 4 on the power play. The Skylands Kings were 1 for 5 with the extra skater. The schedule for round two has not been set as of publication time. The Binghamton Junior Senators, as Northeast Division champions, will host the series. Binghamton swept their series against the Oswego Stampede with scores of 4-1 and 6-0.